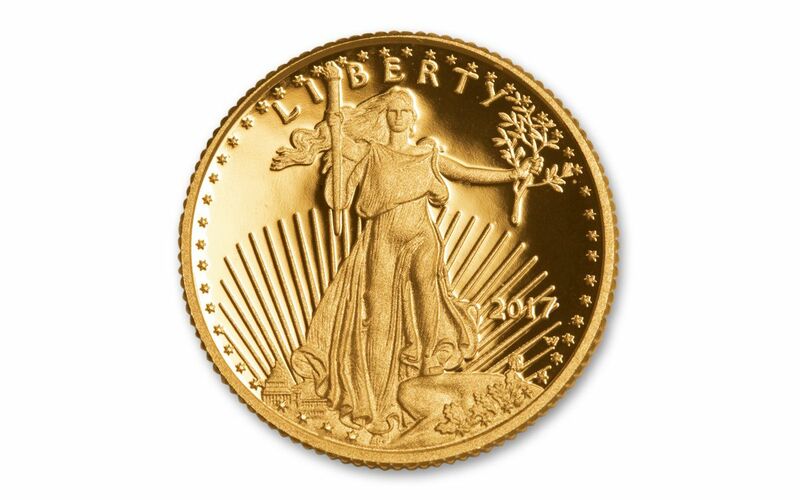 Celebrating its 31st anniversary in 2017, the United States Mint's Gold Eagle is among the most beloved gold bullion coins on the planet. Artistically brilliant and perfectly collectible, each yearly release commands the attention of buyers around the world. But while Uncirculated Gold Eagles have been produced every year since their first run in 1986, the proof versions of these classics have been a bit more sporadic. 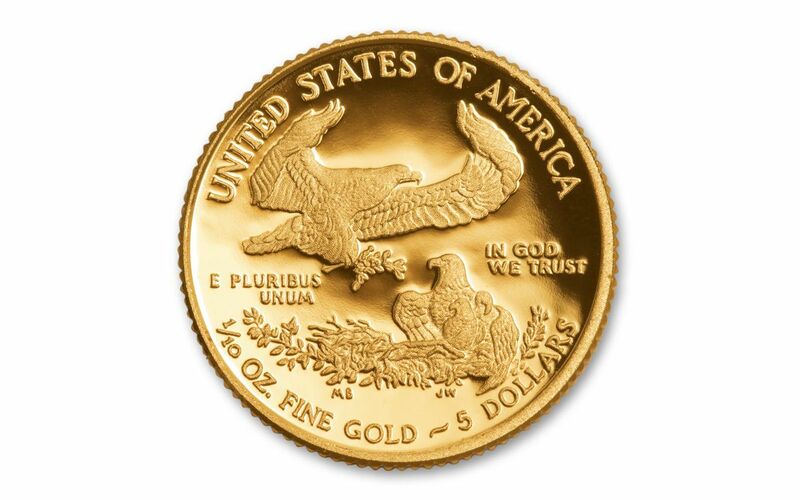 The $5 1/10-oz Gold Eagle Proof didn't make its first appearance until 1988, the third year of the series. With the exception of 2009, these proofs have been minted every year since then. So, while they're highly sought after by collectors, an annual release of Proof Gold Eagles is by no means a sure thing. Add in the fact that the production numbers for Proof Gold Eagles are usually a fraction of the mintage for their uncirculated counterparts and you have a classic recipe for intense demand! That's why we’re excited to announce the return of the $5 1/10-oz Gold Eagle Proof for 2017! Produced at the West Point Mint, each legal-tender coin is struck in one-tenth ounce of .9167 pure gold and exhibits the same beloved designs of Augustus Saint-Gaudens on the obverse and Miley Busiek on the reverse. However, unlike Uncirculated Gold Eagles, each proof is struck multiple times using specially prepared dies and polished planchets. The result is a Gold Eagle with crisp, stunning details and lustrous, mirrored surfaces. 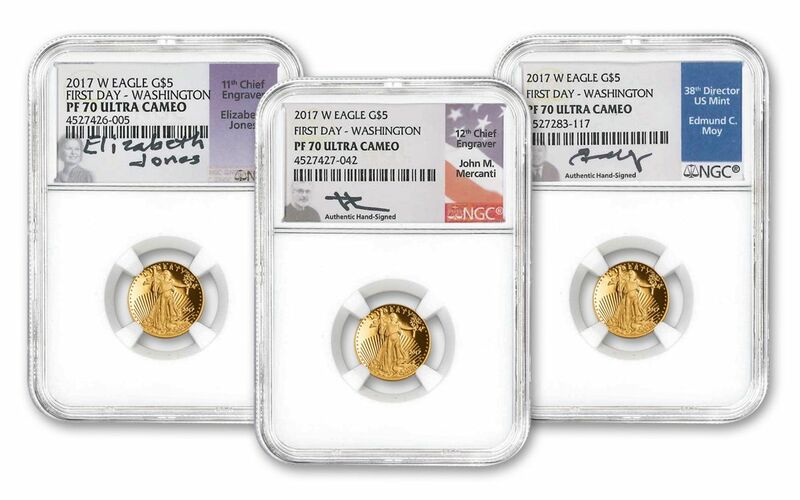 Each coin will be graded Proof-70 Ultra Cameo (PF70 UC) by Numismatic Guaranty Corporation (NGC), a distinction that means your perfectly-graded $5 1/10-oz Gold Eagle Proofs will have ZERO imperfections -- showing all features and fields exactly as the engraver and mint intended! 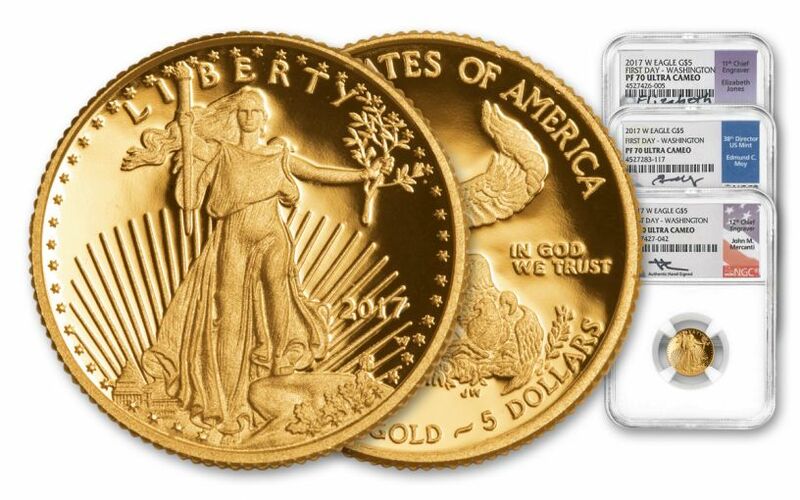 Your $5 1/10-oz Gold Eagle Proofs will also be certified First Day of Issue (FDI) Washington D.C. by NGC, meaning that they were among the first struck by the mint, were purchased directly at the United States Mint's headquarters in Washington D.C. and were certified within the first day of issue. In addition, each proof will be sonically sealed in individual acrylic holders with white display cores -- giving you the best in protection while granting clear sightlines into every beautiful detail. Finally, all of the unique characteristics of your Gold Eagle Proofs will be described in detail on the acrylic holders' labels, one of which will come hand-signed by Elizabeth Jones, the 11th Chief Engraver of the U.S. Mint. Appointed by President Ronald Reagan in 1981, Elizabeth oversaw the creation and launch of the Gold Eagle series in 1986! The second will come hand-signed by the designer of the Gold Eagle's reverse, 12th Chief Engraver of the U.S. Mint John Mercanti, and the third hand-signed by 38th Director of the U.S. Mint Edmund C. Moy!